Windrock Park is throttling up for another action-packed Spring Jamboree. Windrock Park is throttling up for another action-packed Spring Jamboree, April 16 through April 18, 2015. 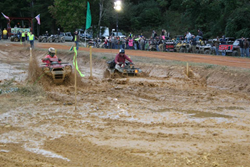 The competitive events include the ATV Rodeo, Windrock Wide Open, which is a three lap race, drag races, the Windrock Challenge, which is an obstacle course race, a mud drag, a poker run and a dash for cash just for the ladies. The competitive event rules can be found at http://www.windrockpark.com under events. On Saturday, April 18th, Janelle Arthur, American Idol’s Season 12 top five performer, will perform live at the new Windrock Hollow concert area. Manufacturers will also be in the Windrock Hollow event area with vehicle demo rides, giveaways and activities all weekend long. The Spring Jamboree requires competitors and riders have a Land Use Permit with cost starting at $17.00 for a one day permit. Event admission is $15 for adults and children 13 and older, $5 for children 6 to 12 and free for children under 6 and is valid for all 3 days. Competition entry/participation is included in the admission fee, with the exception of the Poker Run, which is a fundraiser for local volunteer rescue squads. If you are planning to attend, you’ll want to secure a primitive camping spot, RV spot or luxurious cabin to get the maximum benefit of the Jamboree festivities. The Windrock Park Campground is located on 259 acres with picturesque views of the surrounding mountains. Windrock Park consists of 72,000 acres in Cumberland Mountains of East Tennessee and features over 300 miles of off-roading trails. The entrance to the Park is located at 912 Windrock Road, Oliver Springs, Tennessee. For more information about the park and the jamboree, visit http://www.windrockpark.com or call 865-435-3492.